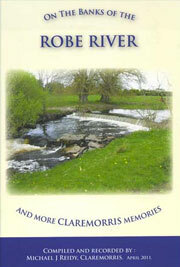 The book is recorded and compiled by Claremorris man, Michael J Reidy. Today we are all too busy to stop and think about where we are and what surrounds us. This book is about the Robe River and many of the things associated with it in the past and many features dating back a couple of hundred years. With the passage of time and drainage works, many physical features and even the course of the river, have changed.